Disappointing, largely pointless fourth instalment that falls down due to a badly written script, boring zombie-blasting sequences, tedious characters, a complete absence of humour and the lack of anything even remotely resembling a plot. Directed by Paul W.S. Anderson, Resident Evil: Afterlife is the fourth in the Resident Evil franchise, based on the popular video game. Picking up more or less where the third part left off, it stars Milla Jovovich as super-powered zombie-basher Alice, who is, once again, squaring off against the sinister Umbrella Organisation (creators of the zombie-creating T-virus), fronted by the evil Chairman Wesker (Shawn Roberts). This time round, Alice reunites with fellow zombie-basher Claire Redfield (Ali Larter, reprising her role from Resident Evil: Extinction) and they both hook up with the time-honoured rag-tag group of survivors (including Wentworth Miller, Boris Kodjoe and Kim Coates) and attempt to get them past an ever-increasing horde of slavering, mutated zombies. To be fair to Resident Evil: Afterlife, they have at least used proper 3D processing, so the effects are pretty decent throughout. That said, there's only one stand-out set-piece, in which Alice and Claire both take on a giant-hammer-wielding, er, giant while burst pipes rain water down all around them in glorious 3D (there's also a nice effect during the credits with the water splashing off the actors' names as they appear). Unfortunately, there are so many problems with the rest of the film that it's difficult to know where to start. For one thing, the plot is practically non-existent and doesn't even bother explaining things for newcomers (or those with poor memories), such as why Alice is somehow able to create clones of herself. However, the script's biggest crime is the appalling dialogue – there's not a trace of wit or imagination in the whole thing. On top of that, the action sequences are loud, annoying, unimaginative and badly directed – most scenes just involve people firing guns in the vague direction of zombies. In addition, the characters are bland, interchangeable (so you don't care who lives and who dies) and frequently tedious – at the very least, the script should have created a likeable rapport between Alice and Claire, but it can't even be bothered to do that. 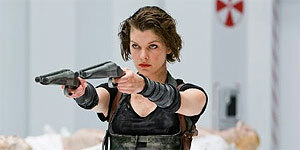 Resident Evil: Afterlife is a huge disappointment, thanks to poor direction and an extremely dull, unimaginative script. Good cliff-hanger, mind.